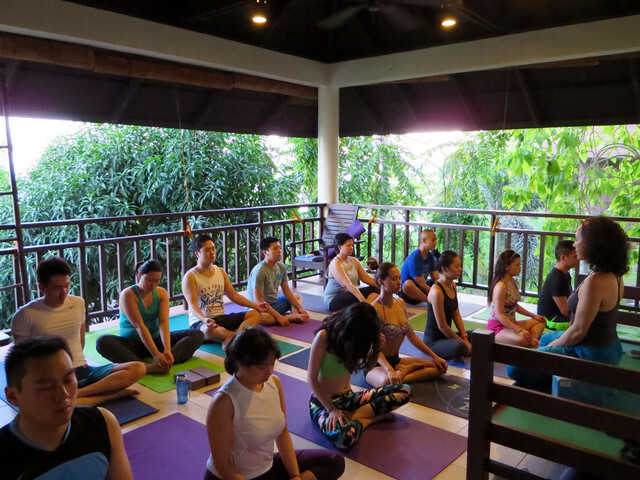 I've been curious about finance lately so when I got invited to Mind Body Soul, a finance and yoga retreat, I was so game! Yes, you read it right. Yoga and finance. The two don't usually mix but organizer Garet Bacani, who's in the finance industry, explained why she thought of putting the two together. Since she leads a hectic life, like most of us do, she had to find a way to de-stress. And that's when she started practicing yoga. 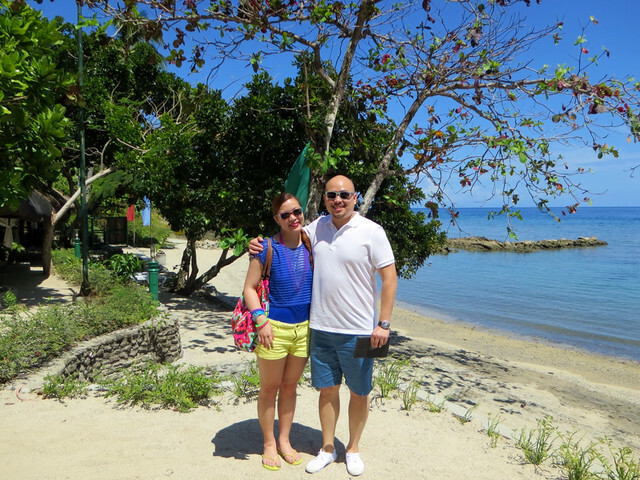 The retreat was held last weekend in Laiya, Batangas (read my blog post about Palm Beach Resort). I was doubly happy that T came with me even if he wasn't feeling well. Transportation, as well as accommodation and all meals, are included in the package rate but T and I brought our own car. 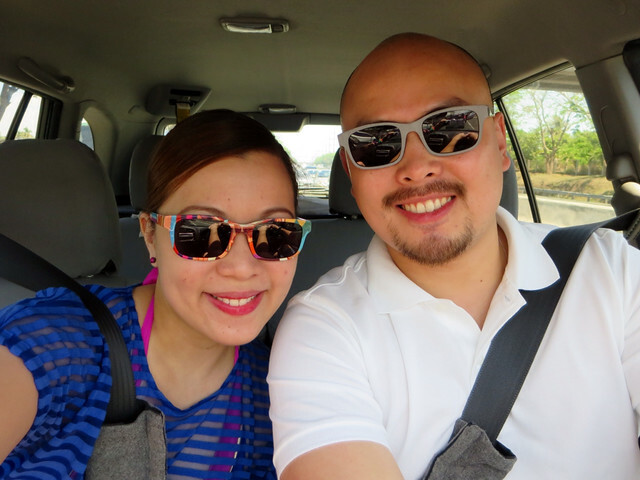 Here we are wearing our Look See sunglasses (check out @LookSeePH on Instagram) on our roadtrip to Laiya. This is first on the agenda. Yay! It's hard to start the day on empty stomachs. 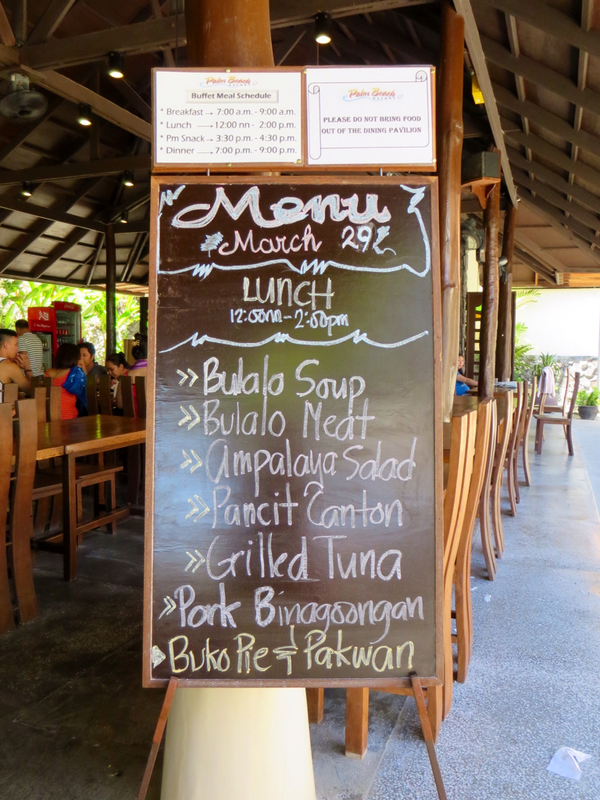 Lunch was a buffet of bulalo soup and meat, ampalaya salad, pancit canton, grilled tuna, pork binagoongan, buko pie, and watermelon. 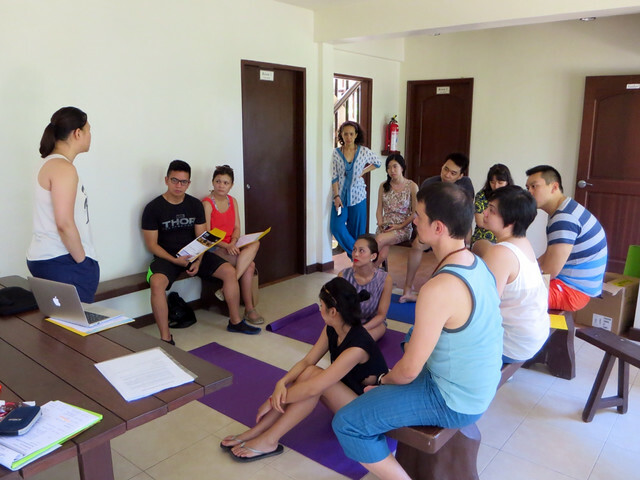 Before this class, yogini Dona Esteban asked us to walk around for five minutes. After the break, she asked everyone to sit on the floor. T and I found this class particularly interesting because Dona was spot on about stress and managing it. According to Dona, stress isn't bad. Stress moves us forward, stress is energy. It's actually handling it the wrong way that creates that negative energy we all experience. The perfect example she gave was traffic. Traffic isn't there to give us stress. It's just there. It's a thing that exists in this world, like any other thing. It's how we react to it that matters. And the same applies when it comes to work, family conflicts, love problems, and all the other things that cause us "stress". 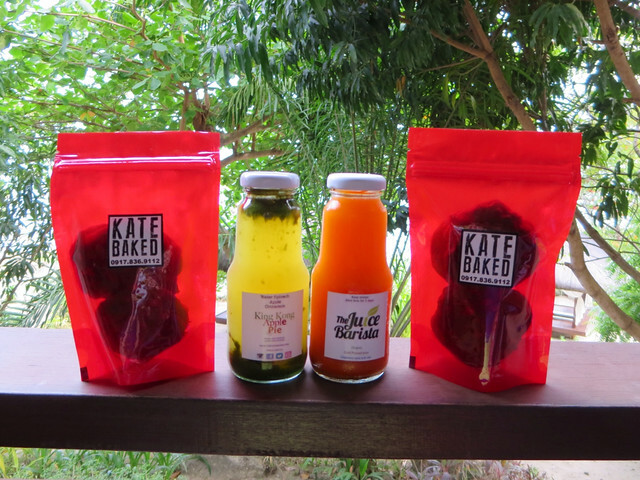 After the stress seminar, we took another break for some snacks from The Juice Barista and Kate Baked Cookies. 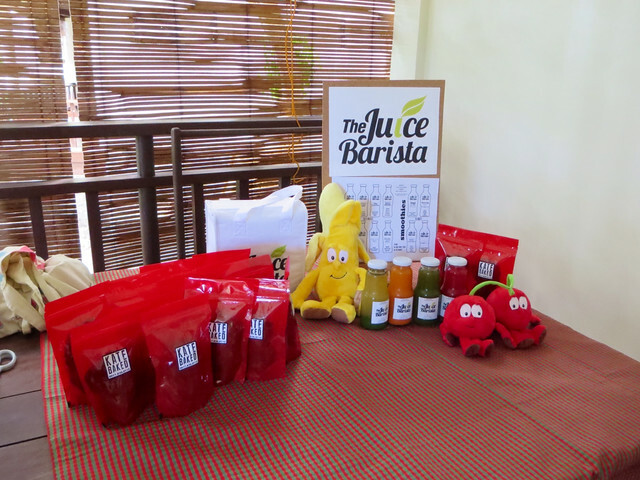 All of the participants got a bag of cookies and a bottle of juice each. This is a seminar I was particularly interested in. I've heard and read about mutual funds but I had some questions I didn't know who to ask. Fortunately, Sarah Uy, who conducted the seminar, answered them. Now I understand what mutual funds are and what they are for. We took another break because hot chocolate and kakanin (local delicacies) were being served in the pavilion. 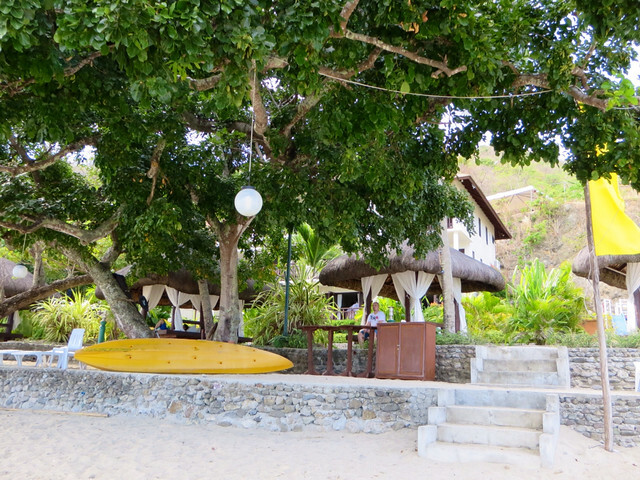 But since we were still full from the juice and cookies, T and I stayed in one of the cabanas by the beach. When I first saw this on the schedule given to me, my first thought was, "What is Yin Yoga?". I've heard of Bikram, Ashtanga, Vinyasa, but never of Yin. 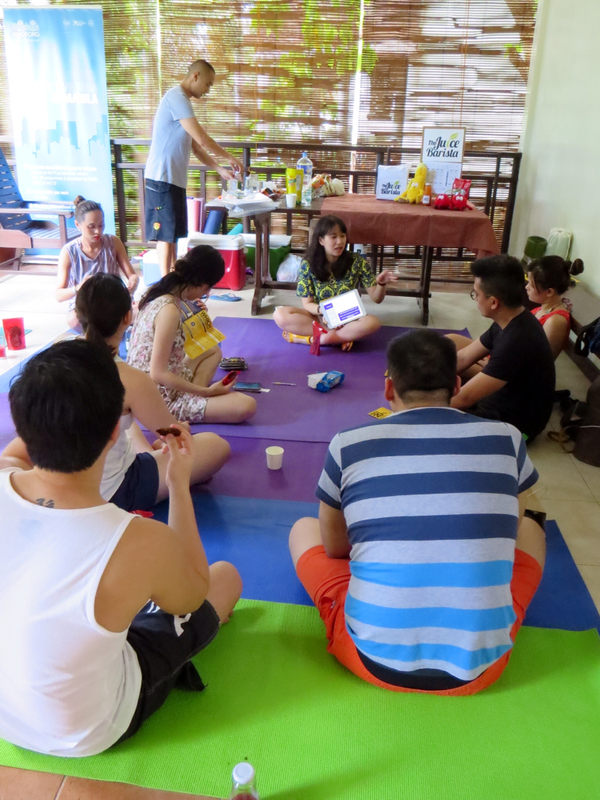 Dona Esteban was the one who led this seminar, assisted by her husband David Esteban. Dona began by asking us the question, "How do you clear muddy waters?". The answer, she told us, is to keep it still. Then she likened muddy waters to our minds, which are usually full of thoughts, problems, and ideas. Basically, things that cause us stress. And to clear it, we should learn the art of keeping still. Through the state of yin, we clear our minds and bodies of "mud". 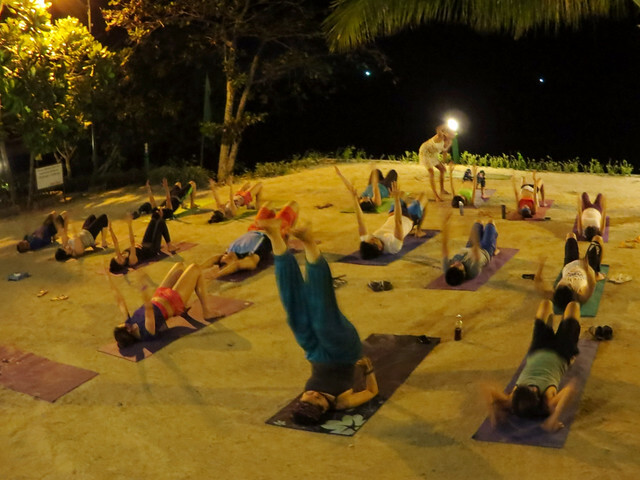 This practice of yoga is so different from all the others that I've tried since it encourages us to relax. It's almost like we were meditating. Some were so relaxed that they fell asleep. I'm not sure whether I reached the state of "yin" or was half asleep but after this session, I surely felt so much more relaxed and my mind so much clearer. 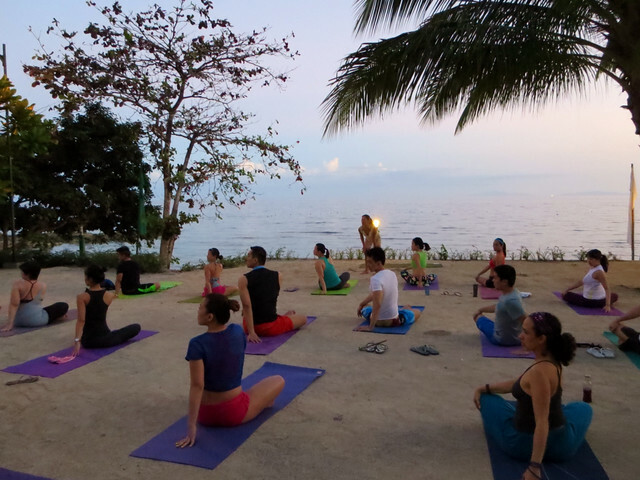 We took another 5 minute break before proceeding to the beachfront for a sunset yoga session led by Matty Roxas Chua. 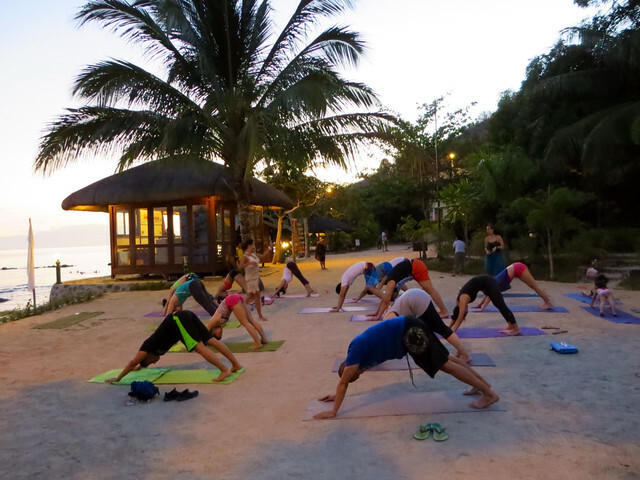 Although a number of retreat participants practiced yoga regularly, this was their first time to do it on the beach so everyone was excited. Since T wasn't feeling well, he couldn't join the session and took photos instead. Thank you T! 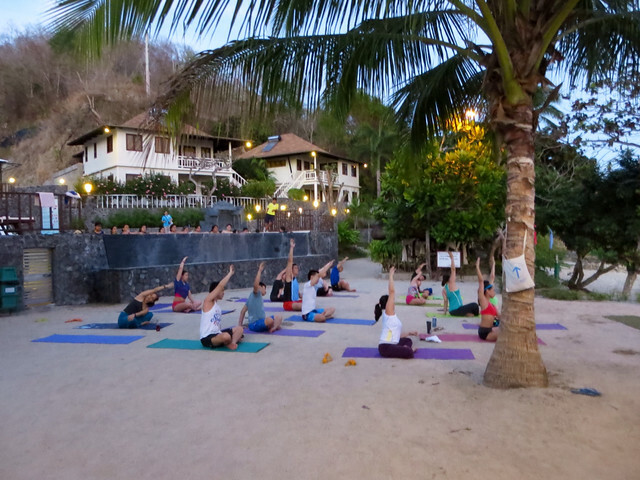 Our sunset yoga session continued into a moonlight yoga session. 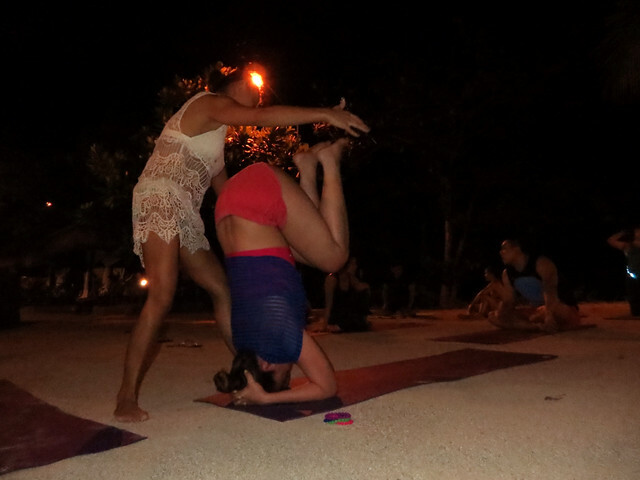 During one pose, almost everyone did headstands so I asked Matty if I could do it even if this was my first mat yoga session (unless Bikram counts). I was happy she said yes and guided me through what I needed to do. I never expected that I could lift my legs off the floor. It felt awesome! Thanks Matty! 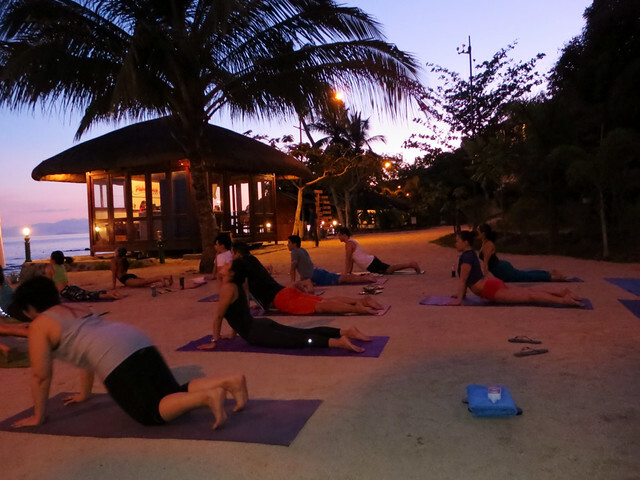 Everyone was famished after our sunset yoga session so we all headed to the pavilion for a dinner buffet. 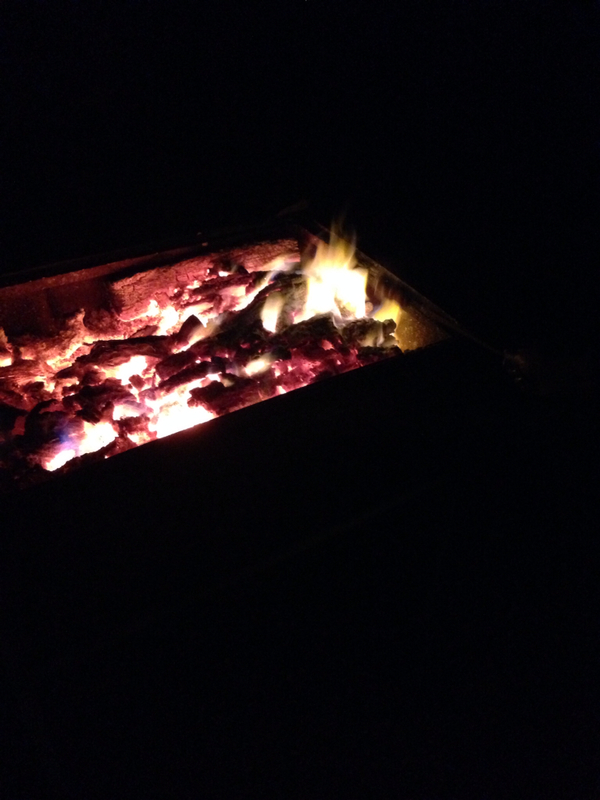 Then Garet had a bonfire set up on the beach so we could roast marshmallows while she did a raffle. T won a week's worth of classes from Yoga+ and P1,000 worth of GCs from The Daily Shirting Company in Rockwell. I won a week's worth of classes from Elorde Boxing Gym and P1,000 worth of GCs from The Daily Shirting Company in Rockwell. Other prizes include GCs from Aura Athletica (I wanted this! ), Sole Academy (T wanted this! 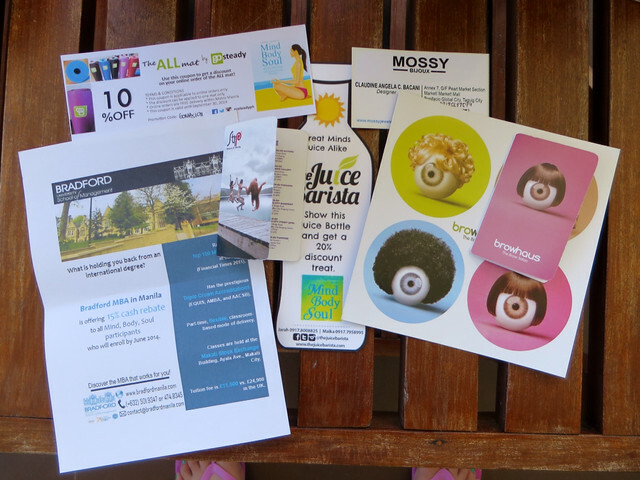 ), Browhaus, and other sponsors. The grand prize was a yoga mat. Everyone started the day early for Power Yoga led by David Esteban but I wasn't feeling well and chose to sleep through the morning. T actually woke up at 6:15 but I just couldn't get out of bed. But when I heard everyone raving about the session, I was sorry I missed it. I'll try to catch this next time! 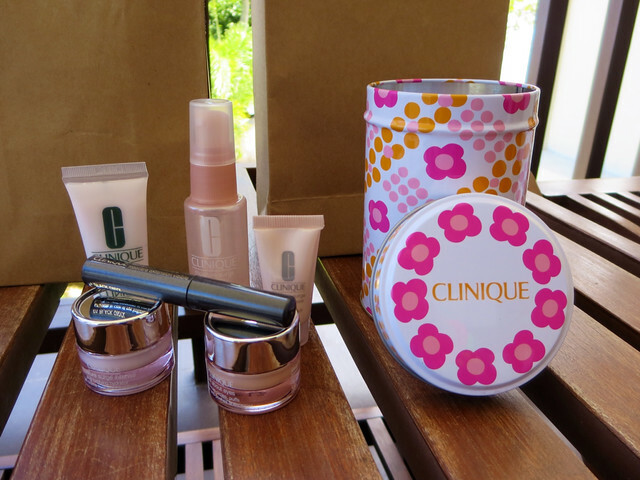 T and I were also given paper bags containing Clinique sets and coupons from different sponsors. I just love goodie bags with freebies we can actually use! For more information on Mind Body Soul, like their Facebook Page and follow them on Twitter and Instagram. Hope everyone had a fun and relaxing weekend as well!